English Teacher On The Loose: Talking Turkey! 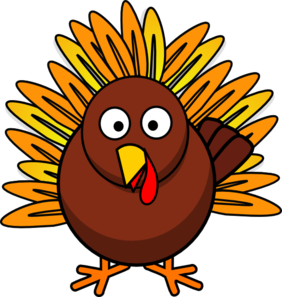 Thanksgiving falls on the 26th of November this year, in the United States. It is always the fourth Thursday in November and the food of choice is a turkey. So I thought it would be a good idea to talk turkey about turkey idioms and expressions in relation to the events that take place for this celebration. I sincerely hope you are not as poor as Job's turkey or doing cold turkey, if the latter then perhaps you ought to see a couch turkey in relation to your problem. To avoid spending the holiday with jive turkeys it is good advice to hire a turkey bacon to keep them away from your House. For those of you watching that all-important ball game, I hope it's not a turkey shoot for your favourite team; if you've placed a bet on them and it is, that would be like turkeys voting for Christmas.